Pontoon - play in the online casino! 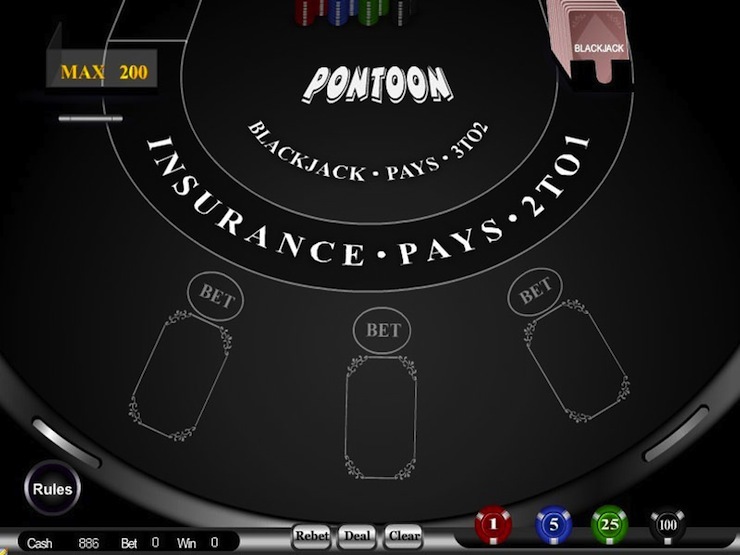 Pontoon is a version of classic blackjack with a number of differences. It is a British version of the game that is ideal for a player who enjoys blackjack, but is looking for a little twist. Pontoon is available in single player, 3 hand and 5 hand modes. The objective of the game is to have your card hand come as close to the value of 21 as possible without going over while still have a higher total than the dealer has. Once the card total is 21 the player may stand and not receive any more cards. If no one had a Pontoon, the dealer adds all the used cards to the bottom of the pack and without shuffling deals a new hand. This makes it possible to improve one's chances by remembering which cards are out of play. If there was a Pontoon, the cards are shuffled and cut before the next deal. If a player other than the banker achieves a Pontoon without splitting their hand, and the banker did not have a Pontoon, then that player becomes the new banker from the next deal. If there are two or more such players, the one nearest to the dealer's left takes over the bank. The bank can also change hands after any hand if the existing banker wishes to sell the bank to another player at a mutually agreed price. Pontoon may not be the most popular online casino game but it still provides a nice break from traditional blackjack variations.